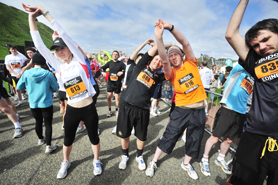 “Five Soldiers” mobilises for a five show tour of duty across Scotland. 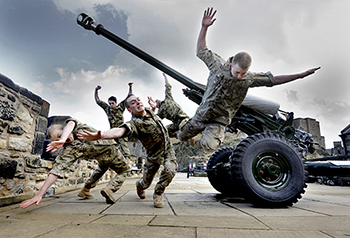 Rosie Kay Dance Company’s very physical piece of dance / theatre scrambles into action at Edinburgh Castle for a publicity event, before launching at Glasgow’s Tramway. 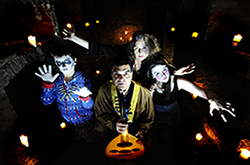 Storytellers and ‘guisers’ – hallowe’en characters – launch the Scottish International Storytelling Festival, which starts on Friday. 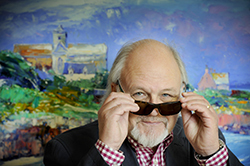 Pictures for the Storytelling Festival and in The Herald, Metro and online publications. 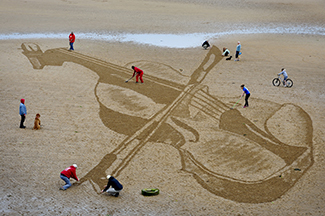 A giant Stradivarius violin drawing on the beach at Elie, Fife, to get the East Neuk Festival of classical music off to a great start. Pictures for the East Neuk Festival.